One of the most beautiful and rare oil paintings in Library and Archives Canada’s collection is this portrait of Colonel John Hale (1728–1806). 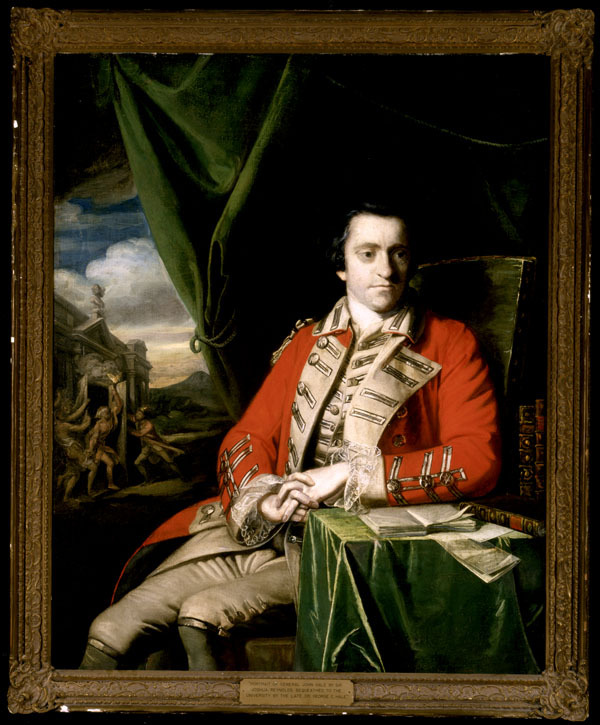 After returning to England as a hero of the Battle of the Plains of Abraham (1759), Hale had this portrait painted by Sir Joshua Reynolds (1723–1792), a famous portrait artist, who is also renowned for his experiments with paint materials and for his stubborn attitude towards the use of one particular colour. In the portrait, the lapels of Hale’s uniform are edged in black in honour of the death of General James Wolfe (1727–1759), a reminder of the most recent and significant battle in Colonel Hale’s career. The unusually pale colour of Hale’s face and hands fits well with this serious subject matter. It also seems appropriate for a portrait of a man who lived a long time ago — as modern viewers might expect, Hale appears to be a ghost out of the past. But Hale’s otherworldly appearance is really a complete accident. To create a flesh colour for faces and hands, Reynolds mixed white pigment with carmine, a dark red pigment made from crushed South American beetles. Unfortunately, early carmine was “fugitive” — it disappeared quickly when exposed to light. This is especially true when, as in this portrait, carmine is mixed with white. White is a colour pigment that is less able to protect carmine from light exposure. Carmine fades away, and white is the main colour that remains behind. For more “spooky” portraits, visit our Flickr album. This entry was posted in Art, Flickr, Military Heritage, Our Collection and Facilities and tagged Art, James Wolfe, John Hale, Library and Archives Canada's Collection, Oil paintings, sir Joshua Reynolds, the Battle of the Plains of Abraham by Library and Archives Canada Blog. Bookmark the permalink.